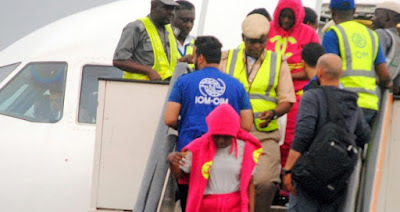 The National Emergency Management Agency, NEMA, on Wednesday said it had received another batch of 121 stranded Nigerians from Libya. The Zonal Coordinator of NEMA, Suleiman Yakubu, received them on behalf of the federal government, enjoining them to learn from their unpleasant experiences in the course of their sojourn. The News Agency of Nigeria, NAN, reports that NEMA had on August 29 received another batch of 139 returnees from Libya. NAN reports that the total number of Nigerian returnees brought back from Libya by the International Organisation for Migration (IOM) from February, 2017 to date is 2,638.